I’m sure I’ve said it a zillionth time before – that I’m a big potato fan. How can anyone resist potatoes? :p On Christmas, I had a mini Christmas feast and this is what I whipped up. Though it’s Christmas, there’s no yule log, no turkey, no gingerbread man, no Christmas tree, no Santa Claus… nope. None of those sort. We only had store-bought roasted spring chicken, a bottle of sparkling juice, two store-bought mango puddings and that was our feast. It was simple, and it was nice. Peel and chop potatoes into chunks. Put the potato chunks into a pot of cold salted water and bring to a boil. Turn the heat down and simmer until the potatoes are cooked. Drain well. Drain the golden raisins, squeezing them to get rid of the extra water. 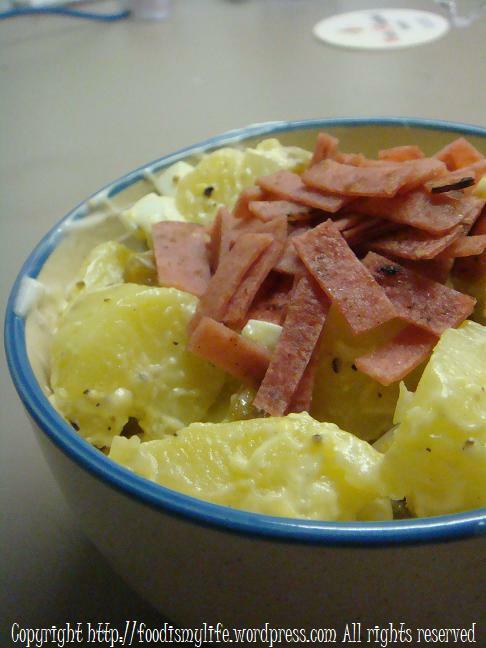 Mix the cooked potatoes, golden raisins, eggs and mayonnaise together. Season with salt and pepper. Add more mayonnaise and/or seasoning you have reached your desired taste. Refrigerate till well-chilled. Sprinkle with ham strips and serve. Alternatively, you can substitute ham strips with bacon bits and add in chopped onion or other ingredients that you like. I shredded the leftover spring chicken meat and mix it into the leftover potato salad and serve it as next day’s brunch. Mmmm… yum!